The ASUS Padfone 2 is a versatile handset as it also powers a tablet that can be turned into a laptop computer. With all of the heavy lifting that the phone does, it's a good thing that ASUS really beefed up the specs with the sequel. 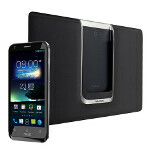 The ASUS Padfone 2 is a high-end model on its own with the quad-core 1.5 GHz Qualcomm Snapdragon S4 Pro APQ8064 under the hood. Throw in 2GB of RAM, a 13MP shooter in back and you have a phone that clearly has a seat at the table with other top-shelf models. 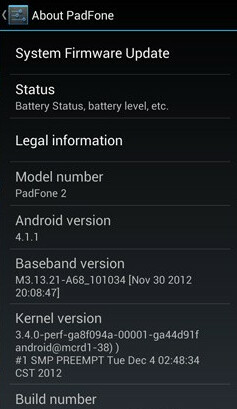 ASUS has always been very quick to update its tablets and now we are happy to report that the ASUS Padfone 2 is receiving Android 4.1.1 right now via an OTA update. And the beauty of the Padfone system is that since the phone is now running Android 4.1.1, so is your tablet and lap top configurations. Why, it's almost magical! If your ASUS Padfone 2 has received the update, let us know what you think by tapping out your comments in the box below. If you own the phone and haven't yet received the update, don't panic as it will come. It still can NOT be turned into a laptop computer. only the first padfone got the keyboard dock. You won't see a US version of the Padfone. The Padfone "cheats" the carriers out of being able to charge you extra for the data used in Tablet mode. This padfone is really a great idea. My friend has one of these (pre-release engineering model). The camera is TERRIBLE. It's 13 MP on paper, but it doesn't look it and it takes forever to refocus. The screen is as gorgeous and sharp as you'd expect, though, and even on ICS the phone was still very smooth. Jelly Bean should make it simply spectacular. The tablet had a set of pins on the bottom edge. It may not have the keyboard dock yet, but judging by the design of the tablet, I'd say that that's on the way. It's an awesome device but it is very expensive. I won't say overpriced. yeah... very expensive..but not overprice..coz of that tablet dock and also there's a keyboard dock! how about d price ?? ?